Sefton Corporate Learning Centre (CLC) has launched brand new e-learning packages that are open to the public for the first time. The CLC has offered classroom based learning to individuals and businesses for several years but has now decided to extend its online learning opportunities further afield. 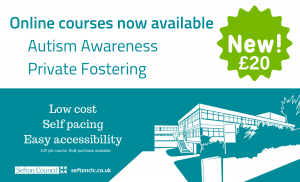 Courses in ‘Autism Awareness’ and ‘Private Fostering’ can be completed online at a cost of £20 for an individual or £15 for more than 10 individuals from the same organisation. Part of Sefton Council’s learning and development portfolio, the Ainsdale-based centre has previously only provided e-learning to Sefton Council staff. These new online packages mark a significant move towards making learning accessible to more people both in Sefton and further afield. ‘Autism Awareness’ intends to provide a basic understanding of autistic spectrum disorders and ‘Private Fostering’ will help learners to know more about situations where children are looked after in a ‘private’ arrangement by someone who is not a close relative. Cllr Marion Atkinson, Sefton Council’s Cabinet Member for Skills and Regeneration, said: “E-learning is an excellent way to extend your knowledge in a way that it right for you. The course can be completed at your own pace within an environment that it most suitable for you or your organisation.